Colorado has 9 Welcome Centers, located in key entrance points across the state. The Welcome Centers, which are staffed by an outstanding group of volunteers, serve as a great source of information for visitors coming to Colorado. 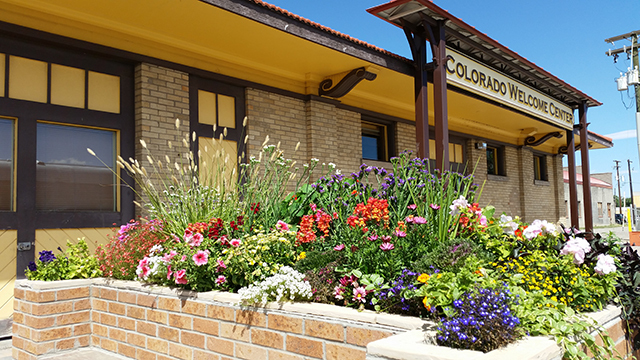 The Alamosa Welcome Center is particularly unique as it is located in the historic Alamosa Train Depot. Alamosa was founded, in part, to accomodate the railroad. The first Denver & Rio Grande train arrived in Alamosa in 1870. By 1880, it was the center of narrow gauge railroading in America. The Alamosa Train Depot was built in 1908-1909. The town quickly sprung up from the railroad and Sixth Street became the heart of activity and commerce. After the decline of railroad transportation, the building was used for various government offices over the years. In 2009, the interior renovations were made for the Colorado Welcome Center to move into their ideal home. Listed on the National Historic Register, the Depot features the architecture and memorabilia reminiscent of a bygone era. Partnering with the Rio Grande Scenic Railroad, this center offers visitors a place to stop and stretch their legs, or pick up their train tickets for a ride on the Railroad. Located in the historic railroad depot on the corner of State Ave. and 6th St.